Kate Beckinsale ('The Aviator', 'Pearl Harbour') reprises her role as Vampire Death Dealer Selene in an action-packed plot filled to the brim with battles, betrayal and blood. Joined by Theo James ('Divergent', 'Downton Abbey'), Tobias Menzies ('Casino Royale', 'Atonement'), Lara Pulver ('Edge Of Tomorrow', 'The Special Relationship') and Charles Dance ('The Imitation Game', 'Ghostbusters'), Selene fights to end the age-old Lycan and Vampire war with the ultimate sacrifice. Death dealer Selene (Beckinsale) finds herself hunted once again, by both the Lycan clan and the Vampire faction that betrayed her. With only David (Theo James) and his father Thomas (Charles Dance) as her allies against the brutal attacks, she must do everything within her power to end the eternal war between the Lycans and Vampires once and for all – even if it means the ultimate sacrifice. The 'Underworld: Blood Wars' competition has now closed. Winners will be announced shortly. Competition opens at 5pm AEDT on Sunday 19th March 2017 and closes at 11:59pm AEDT on Sunday 26th March 2017. Five winners will be chosen at random on Monday 27th March 2017. To successfully win, entrants must fulfil the above entry conditions before the time the competition closes. Current members/followers are eligible to enter the competition. Only one entry per person. Only one winner per household. To be a valid winner, the entrant must not have won a prize from SWITCH within the last 28 days. Each winner will receive one Ultraviolet Blu-ray copy of 'Underworld: Blood Wars'. By entering, you agree to receive occasional emails from SWITCH in the future. If you decide to unsubscribe from these updates, any further entries will not be applicable. Only Australian residents are eligible to enter. 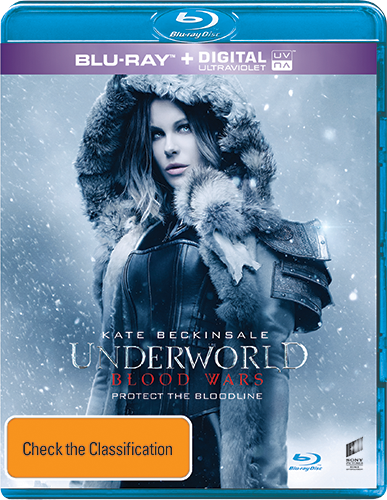 'Underworld: Blood Wars' is available on Digital, Ultraviolet 4K Ultra HD, Ultraviolet Blu-ray, Ultraviolet Blu-ray 3D and Ultraviolet DVD on Wednesday the 22nd March 2017 from Universal Sony.